The glass is thick at about 3 1/2 inches and originally came in 12 by 8-inch slabs weighing about 4 lbs. He further breaks the larger pieces with a specialized hammer, rather than sawing it. He wraps each piece with copper foil that sticks to the glass on one side. He solders the pieces together, washes them, and then applies a black or copper patina to finish the piece. 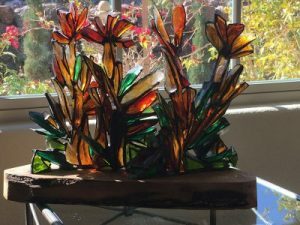 “Glass is a hobby,” he says, a “stress-reliever.” He doesn’t think of himself as a professional artist, but will reluctantly call himself an artist, working in a unique way to create unique gifts for others. About fifty-percent of his pieces are abstract, and the other half are taken from nature or Christian themes. When pressed, he’ll say “I love the play of light on, and through, the glass, and all the varied colors we see reflected in glass, in nature, and in life”. He loves taking broken pieces of glass, broken like all of us are broken, and ‘waking it up’ to something glorious, just like we humans are made to ‘wake up’ to what is holy and eternal in our own souls. 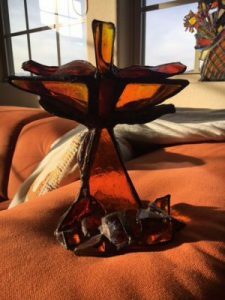 Hence, the connection between the art of spiritual direction and the art of stained glass design. His work has been selected for several Annual Juried Art Shows. Currently, he is content for his ongoing art to simply be a hobby. 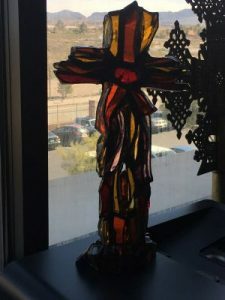 One of his many designs, a small cross created from various shades of earth tone glass which is transformed throughout the day, varying with the change and the intensity of the suns’ rays passing through the many elements of the artist created work.